Even the best quality jewelry requires special care to keep it looking great. Whether you own mostly costume pieces of have an extensive fine jewelry wardrobe, knowing how to care for your treasures is essential. From proper storage to gentle cleaning, taking good care of your jewelry can help you get the most out of your collection. Although costume jewelry and fine jewelry are crafted from different materials and have different values, many of the same rules apply to the care of both types. It's tempting to put your jewelry on as you get dressed in the morning or prepare for a night out. However, it's better to wait until you're completely ready before donning your jewels. Whether you're wearing diamonds or rhinestones, the chemicals from make-up, hair products, and perfume can damage your pieces. It's best to think of jewelry as the finishing touch for your look. Although occasional exposure to hand and body lotion won't damage most fine jewelry, it can destroy the finish on costume pieces. In addition, build-up of lotion products can lead to more frequent cleaning of your valuable items. It's best to put lotion on your hands or body after you've taken your jewelry off at night. No matter how careful you are when wearing your jewelry, it can also sustain damage during storage. Often, this comes from pieces knocking together or getting tangled. Particularly vulnerable materials include pearls, wood, plastic, precious metals, and some gemstones. The best way to solve this problem is to store your items so they can't touch one another. While regular storage is important, travel storage is even more essential. Tossing your jewelry in a toiletry bag or suitcase can cause a great deal of damage. You can protect your pieces by using specially designed travel jewelry cases or jewelry rolls that will keep you special items safe and tangle-free. As you wear and store your jewelry, it's easy for pieces to get dirty and damaged. Before you put on a pair of earrings or a necklace, take a good look at the item. Then you can identify those pieces that need cleaning or repair. If it has a clasp, is the clasp secure? Are the stones set solidly in the piece? Do they wiggle at all? Is the item sparkling and beautiful, or is it starting to get dirty? Are there scratches or other areas of damage? Does the items have tarnish or other finish issues? Before you try to clean any of your jewelry items, it's essential that you know about the materials used in constructing your treasures. There are very different procedures for cleaning diamonds or zirconia rings and pearl jewelry, for instance. Certain types of costume jewelry should never be submerged in water, while special mild polishes can restore the shine to sterling silver necklaces. Examine your jewelry for information about the materials in it. Often, you'll find a stamp on the back or inside of a piece that may tell you the metal content. Make a note of the gems or other materials when you purchase new pieces. That way, you'll know what to do when you need to clean your items. 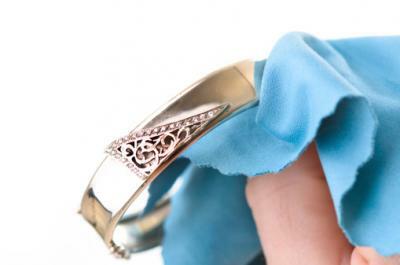 If you clean your jewelry, it may seem sufficient to pat it dry with a chamois and then store it. However, small amounts of moisture left over from cleaning can destroy your collection. Wait at least an hour after cleaning any piece before you put it back in your jewelry box or case. This will give the moisture enough time to fully evaporate. Caring for you jewelry is an important part of maintaining its value and beauty. From diamond engagement rings to fashion jewelry, every items looks better and lasts longer when you know how to take great care of it. Use your judgment and take your time, and you'll keep your jewelry wardrobe looking as good as new.